Two-thirds of the fastest growing companies fail. This statistic from the Kauffman Foundation’s report should startle you. 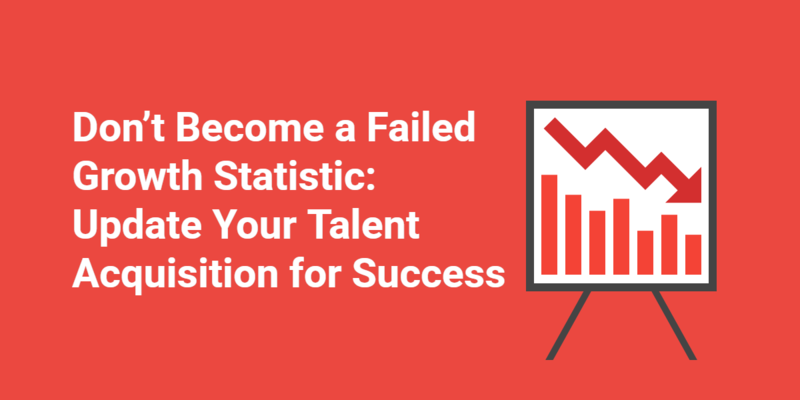 With a high rate of failure, even your rapidly growing company could be at risk. Before you decide if it’s in jeopardy, it’s important to understand what factors are sending failure numbers through the roof. The most detrimental issue is the inability to reach a point of self-sustainment. Companies focus on talent acquisition needs while they’re in the eye of the growth-storm. However, once the growth subsides, employees are put in charge of new responsibilities. Often, this includes ones that weren’t originally in their job description. Unfortunately, employees either can’t keep up with the changes to their roles or they end up leaving for something more fitting to their initial expectations. The key takeaway here is the note of more than one vision. When your company is growing rapidly, it’s crucial to know your short-term and long-term vision. Expressing long-term goals is just as, or even more, important than short-term during a talent acquisition phase. Employees who are excited about your rapidly growing company may lose passion once the pace levels out. This leaves you with less-than-enthusiastic employees in charge of your company when it’s at a successful peak. Ensure candidates will be invested for the long-haul by communicating your future goals and vision during talent acquisition. Personalize your communication efforts for each candidate during the interview, follow-ups, and updates to give them a complete picture of your company. Sharing the company’s and your own personal goals is a great way to engage and educate candidates on where the company is headed and why. In turn, their responses will be more connected and personal, giving you the opportunity to measure their fit for rapid growth and beyond. 2. Assess their desire to grow. As your company grows, so will your need for employees who want to grow with it. You don’t need perfection on your team, but rather people who want to develop into the perfect employees for the company’s needs. You’ll, naturally, start with the candidates’ resumes during the talent acquisition phase. You want to look specifically for evidence that they grew into new roles and took advantage of educational advancement opportunities. Then, when you have them face-to-face — or screen-to-screen in a video interview — ask what inspired them to grow with their former companies. Knowing the inspiration behind their growth helps you assess if they’ll be motivated to develop with your company. Also, ask candidates to list their future goals. But don’t end the conversation there. Discuss what they’re willing to do to reach those goals and what they think is most important when growing with a company. If the basis of their answer is asking questions and doing whatever tasks are needed to help the company succeed, you’ve found a team member who can help you sustain your growing company’s success. When you’re in charge of talent acquisition in a rapidly growing company, you must be aware of every trait candidates bring to the table. A candidate can check off qualification boxes, but if their professional motivations are off, they won’t make it in the long run. For example, a candidate who shares your vision for the company may seem perfect. However, if they’re motivated by continuously moving up the ladder, they likely won’t stay on board if the company’s growth levels out. On the other hand, a candidate who is motivated by seeing goals through to the end and nurturing company success through the thick of it will be more suited to take on the job from start to finish. Discovering professional motivations relies on your ability to dig beneath the surface when interviewing candidates. Personalize your interview questions based on candidates’ employment histories, cover letters, and one-way video interviews. Ask them what motivated them to move on from previous careers. Find out what inspired their volunteer efforts. And discover who their mentors were, and what they admired about them. How do you know if a candidate has what it takes to promote rapid growth? Let us know in the comments below!